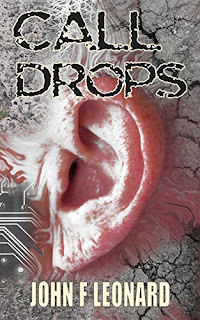 Call Drops by John F.Leonard is a simmering short horror story full of intrigue and horror. Vincent Preece a hard grafting self made millionaire but his life is empty and everything and everyone he has ever loved is gone leaving him with too much time in his huge mansion set on the edge of the woods. To take his mind off his current state of affairs he loves nothing more than to rummage around junk shops in search of old forgotten treasure. At a car boot sale he finds an odd phone that seemingly doesn't work. It will change his life forever. I thoroughly enjoyed this tale it was dark with lots of mystery and intrigue piled on top. Its really creepy and creepier! The story will stay with you long after you have stopped reading. It seems in this tale that everyone is in possession of a secret they would rather keep buried in this world of shady characters. Call Drops was unlike anything I've ever read before which was great it kept me on my toes and I had no idea what was going to happen next. I really enjoyed this and can't to see what this author writes next!